Denmark is one step closer to becoming the second international customer to have the U.S. Navy’s MH-60R Seahawk helicopter in its inventory. The first two aircraft arrived at Lockheed Martin’s Owego, New York facility for digital cockpit and integrated mission systems and sensors installation July 9 and are anticipated to be delivered to the US Navy later this yea (before transfer to the end customer). The Danish defence ministry selected to replace its ageing Westland Lynx with the Sikorsky/Lockheed Martin MH-60R Seahawk "Romeo" (over the AgustaWestland AW159 Lynx Wildcat) in November 2012. The Royal Danish Navy is the second export customer for the Romeo following the Royal Australian Navy. Denmark ordered nine helicopters while Australia ordered 24 and has started receiving the first ones last year. The U.S. Navy is projected to acquire 291 MH-60R helicopters. 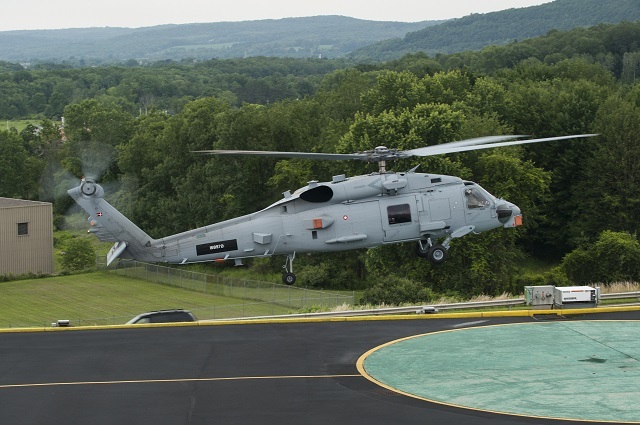 Manufactured by Sikorsky Aircraft Corp and provided with advanced mission systems and sensors by Lockheed Martin, the MH-60R employs a modular design, which refers to the ability to modify weapon systems to match specific mission requirements. The modularity gives this single platform the agility to provide greater surveillance and flexibility to the Fleet, tailored for the mission. Aboard the MH-60R, sensor data is integrated into actionable information for the three-member crew. The mission systems compile data from onboard and offboard sensors to create an integrated picture that enhances decision-making.